Patience is a Virtue | OMG I'm fifty! Patience threatened to leave me at the beginning of this week, making me a little tense and strained. By yesterday it had packed its bags and gone to live with someone else, throwing me into a state of irritability which has very rarely been seen. The biggest problem however is that this is not even my Bad Week. 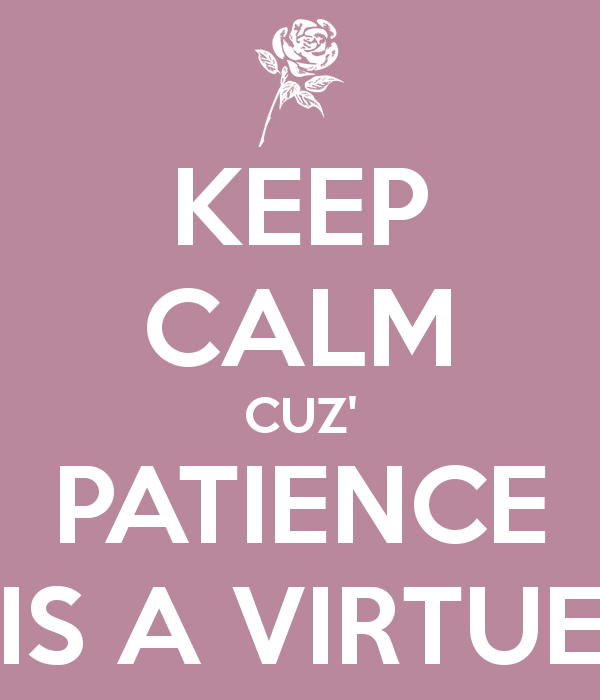 Patience often deserts me during the awful run-up to menstruation. I’ve mentioned this before and it has become an entirely normal and regular event in my life and the lives of the poor people who surround me, especially my loved ones at home. But once the red river dries up it comes back and we all start breathing again. This week Patience upped and offed while I was at work, a place where we usually go together, hand in hand. Patience keeps me smiling and joking and dealing with people in a wholly genuine and kindly way. With its help I stay cool, calm and collected in almost all circumstances. There was none of that over the last couple of days. I became a wild tiger in a cage, desperate to break out and rip apart the people in front of me. If I had allowed myself I would have grabbed onto the students’ hair and smashed their heads on my desk, repeatedly. Then I would have thrown their cups of tea in their ugly faces and kicked their stupid arses out of the front door. I have a feeling that this could be the onset of “Menopausal Irritability”. I have just checked the internet to see. Drat. It sounds like it might be just that. There is no mention of tearing out people’s hair or smashing their faces on hard surfaces. But the rest sounds familiar – impatience, less tolerance, overreaction and trouble sleeping. I’ve met up with them all this week. Ho hum. I suppose I’ll just have to keep popping my little white homeopathic relaxation pills. Every day now, not just one week per month. Then I’ll ring Patience and beg it to come back to me. And I will feed it with chocolate. The menopause website says it could be a cure for this highly annoying symptom. Now there’s a great excuse for a choc-fest if ever I heard one. So excuse me, I’m off down the shops for some Cadbury’s. This entry was posted in Non classé and tagged humour, lifestyle, relationships. Bookmark the permalink.